How to Download Videos from Maker.tv in Batch on Mac or Windows? Batch downloading videos from YouTube, Vimeo, Dailymotion, Livestream, SBS, IMDB, Metacafe, VH1, NBC, Comedy Central, Tenplay, TV.com, BBC. Trying to download videos from maker.tv ( formerly blip.tv)? How to get the web series from Blip to playback offline? Blip, a media platform for web series, offers a wide variety of comedies, sports, dramas and other shows. If you would like to download Blip videos from maker.tv, the new site, you may try to find a powerful video downloader. 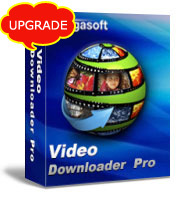 Bigasoft Video Downloader Pro is one of the highly recommended Maker.TV Downloader which helps to batch download and convert videos from maker.tv to MP4, AVI, MKV, MOV, VOB, etc. In the following article, we will show you a step-by-step guide on how to download Maker.TV videos in batch on Mac or Windows. How to download Blip videos from maker.tv? Firstly, download and install the ideal Maker.TV Downloader - Bigasoft Video Downloader Pro. There are two different versions for Windows and Mac users separately. And they are fully compatible with the latest OS. Batch download Blip videos from maker.tv and save them to your desired format, including MP4, AVI, MKV, VOB, MOV, VOB, WebM, FLV and more. Download video or audio from maker.tv and YouTube, Vimeo, Dailymotion, Livestream, SBS, IMDB, Metacafe, VH1, NBC, Comedy Central, Tenplay, TV.com, BBC, etc. Support F4F sites and convert or merge downloaded F4F files to a more popular format. Capture live streamings with best quality and save it to MP4. Support for RTMP, HDS and HLS protocols and VOD files download. Copy the URL of the Maker.TV video which you want to download from the address box of your browser, then paste it to the text box on the left side of Paste URL button. Actually, as soon as you mouse over the download panel, the URL will be pasted automatically. Click "Save Folder" button to choose the destination folder for the downloaded Maker.TV video. If you prefer to download videos from Maker.tv to apps on your PC, smart phones or tablets, you may need to save them to certain format. Just click the "Automatically Convert to" drop-down button to select compatible video or audio format. After all settings are done, click "Download" button to start the Blip downloading. Right-click the item in Activity panel and choose "Locate Downloaded File" to get the downloaded Blip/Maker.TV videos. Besides downloading video shows from Maker.TV as well as other sites, Bigasoft Video Downloader Pro also helps to capture live streamings and convert/merge downloaded F4F files. Download the professional online video downloader and enjoy it!